E-nable France is a non-profit association created in November 2015 in Paris. The goal of this association is to provide for free 3D printed hand prosthesis mainly for kids (but it works for adults too) who are diagnosed with agenesia (born with missing fingers or hand). Based on open-source files created by individuals all around the world, we build a network of Makers (people who own a 3D printer) and who are willing to help local families who are asking for a prosthesis ( www.e-nable.fr).E-nable France is the French Chapter of the international wide e-nable association (Enabling the Future, enablingthefuture.org). 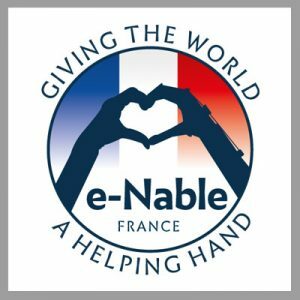 On November of 2015, the e-Nable France Chapter was born as an official Loi De 1901 Non-Profit with the hopes of helping to serve the needs of those disabled kids seeking devices in France. Their website available in French them serve some of the French speaking areas such as Belgium, Switzerland, Morocco and Canada. In fact, e-nable France, its Director, Thierry Oquidam and the e-nable France volunteers are hoping to encourage more European makers to join and help connect directly to recipients in need, in their own local communities.e-nable France has 400 makers register in their web site who are ready to help kids with agenesia. There are 360 kids born with agenesia every year in France, this means that e-Nable France is targeting a population of around 5000 kids between 5 to 15 years old. e-nable not only is delivering prostethics hands to kids but it is disseminating the objective of using ICT and digital devices to intervene into inclusion strategies.